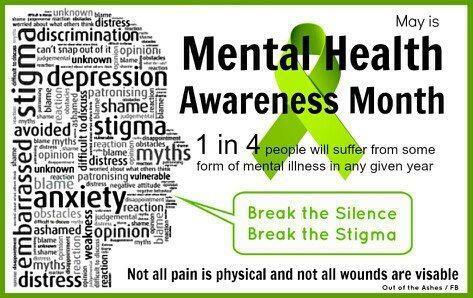 May is Mental Health Awareness Month. While many of us are focused on our physical health, we should also be concerned about our mental health, and those whom we love. Make May the month you check in with yourself, your friends, your family, and see how they truly are doing mentally. If you are struggling, ask for help. See a therapist. Talk with a friend. Make an appointment with your physician. Just reach out. Asking for help is not a sign of weakness. It is a sign of strength. We aren’t meant to combat life on our own. Teach your children to be mindful of others. If they see a child playing alone or retreating, teach them to reach out and at least say hello. We certainly can’t make our children be friends with others, but we can teach them to be friendly and thoughtful. Same goes with us adults. A smile. A nod. A wave. Any of these greetings could seriously make someone’s day, even save a life. In the last 4 years I have known two people to end their lives. Young men. Both were hurting in their own ways. One was a former student of mine, and while his family was trying to help him forge through the darkness, not enough was really known about the severity of his mental health. In general not enough is done in regards to mental health. Sometimes it is taken too lightly. People are afraid to talk about it, and therefore they either go undiagnosed or don’t ask for help when they really need it, and continue to struggle with their demons. There continues to be a stigma and we need to break it through education. Be kind to one another. Reach out. Ask for help.